Mix together all of the dry ingredients for your dumplings, then stir in buttermilk and melted butter until combined and set aside. In a large Dutch oven coated with oil, add the onion, garlic, carrots, celery, thyme and bay leaf and cook over a medium-low heat. Cook and stir for about 6 minutes or until the vegetables are softened, but not browned. Pour in the chicken stock and bring the liquid to a simmer. Fold in the chicken, and continue to simmer for another couple of minutes to heat through. Then, season to taste with salt and black pepper. 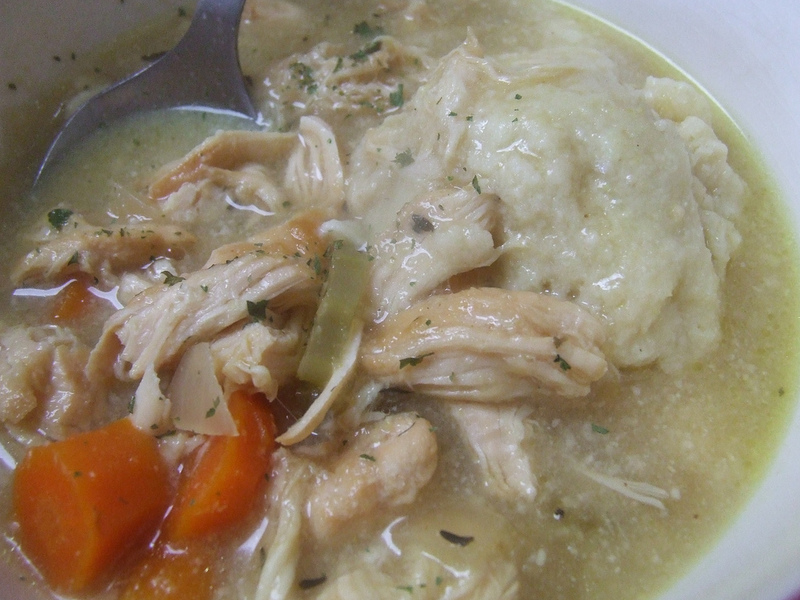 Using a large spoon or scoop carefully float your dumplings in the soup. I like mine on the bigger side but generally about the size of golf balls. Cover and cook your dumplings for about ten minutes or until they are cooked through. Season your chicken with kosher salt and black pepper while heating a large skillet with three tablespoons of vegetable oil over high heat. Brown your chicken until it’s a nice dark golden brown color – about three minutes per side. Once your chicken is browned remove it from the skillet, and add about a cup of water to the pan scraping the caramelized bits off with a wooden spoon. Place all ingredients and the chicken bits/liquid from the pan in a large stock pot and cover with approximately 3 quarts of cold water or until the ingredients are just covered. Dimensions of the post and the size of your chicken may effect this and so the amount of water needed to cover may vary but should be about three quarts. It is important that the ingredients are floating slightly. Bring the stock up to a gentle simmer over medium heat making sure not to boil it. As it cooks, skim the foam that rise to the surface with a large serving spoon or a shallow ladle. Add a little water if necessary to keep the chicken covered while simmering. Simmer the stock until the chicken is cooked through about 30 minutes then turn it off and allow it to cool for an additional 15 minutes. Once the stock has cooled you can skin the fat and remaining impurities from the top. Move the chicken carefully to a large flat container such as a casserole dish or cutting board. When its cool enough to handle, hand-shred the meat into a storage container discarding the skin and bones. Carefully strain the stock through a fine sieve into another pot or large heat-proof container, and set aside until you are ready to add it in. Here are some great events serving the soup, currently listed on Brown Paper Tickets! Saturday, January 18th and Thursday, January 30th | FARM TOUR & LUNCH, co-hosted by Tully Dolci & Weirauch Creamery – Petaluma, California Farm tour and lunch co-hosted by Weirauch Creamery, and Tully Dolci Organic Farm. Weirauch Creamery and Tully Dolci Organic Farm operate their businesses off of the same ranch in Petaluma, California, 40 miles north of the Golden Gate Bridge. Ring in the holidays and the new year together! Tuesday, January 21st | Soup’s On 2014 – Shreveport, Louisiana It’s that delicious time of year, time for Slow Food North Louisiana’s annual soup sampling soiree called Soup’s On! This go ’round they’ll feature soups donated by professional chefs, all for your slurping pleasure. Friday, January 24th | Snow Day: A CAC Beardsley Community Farm Benefit – Knoxville, Tennessee The 6th annual Snow Day, a CAC Beardsley Community Farm Benefit, will be hosted at Barley’s Taproom and Pizzeria on Friday, January 24th. CAC Beardsley Community Farm is Knoxville’s only urban demonstration farm that helps get fresh, healthy, local food to Knoxville’s under-served communities. Sunday, January 26th | Souper Bowl II – Colonial Heights, Virginia Taste soups for two great causes- Central Virginia Legal Aid Society and Rebuilding Together*Tri-Cities. Enjoy soups prepared by local restaurants. The restaurants will compete for Best Soup and People’s Choice Award. Music will be provided by the Hullabaloos, a British cover band. Children’s activities presented by C-MOR (Children’s Museum of Richmond). Saturday, February 8th | Soup & Bread Dinner 2014 – Okanogan, Washington Soup & Bread Dinner 2014 is a fundraiser for Okanogan County Community Action Council’s (OCCAC’s) Food For All project. It will be held at the Okanogan Grange. General Admission comes with a ceramic bowl hand-painted by a student of the Okanogan High School!